In lieu of flowers memorial donations may be made to the American Heart Association. Make checks payable to American Heart Association and send to Bland-Hackleman Funeral Home, P.O. Box 44, El Dorado Springs, MO, 64744. 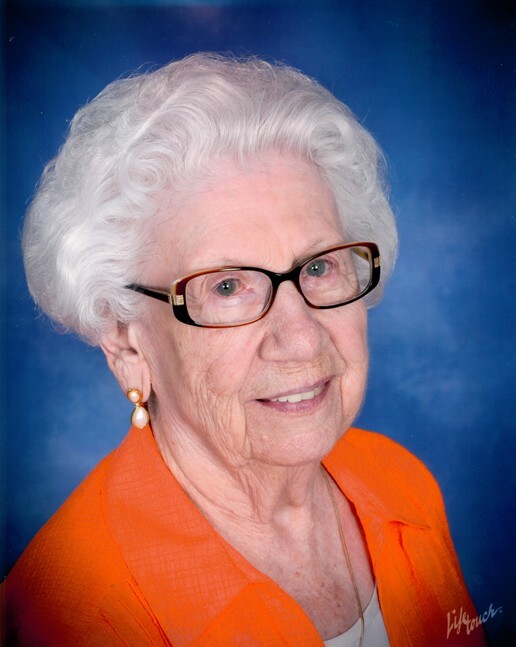 Arda Minnie (Hill) Lancaster, age 92, of Eldorado Springs, Missouri, passed away on Saturday afternoon, October 25, 2014. Arda was born December 22, 1921, at Ash Grove, Kansas, the daughter of John Arthur Hill and Emma Marie (Brungardt) Hill. Her mother was her best friend and Arda cared for her mother until her death in 1976. She was preceded in death by her parents and her eight siblings. Arda helped raise her younger brothers and run the family grocery store in Ash Grove. As a young woman, she attended cosmetology school in Salina, Kansas and worked as a hair dresser. Arda married Ethan Verle Lancaster on October 26, 1973, the love of her life. They resided in Wichita and later moved to El Dorado Springs. She traveled with Verle on his job with Halliburton Oil Company and on leisure vacations. It didn’t matter where they were as long as they were together. Verle died in 1989. The most important part of her life was her family. What she enjoyed most in life was spending time with her loved ones. Having no children of her own, she “adopted” all her nieces and nephews as her own, as well as other special friends. She called them her ‘kids”. For her “kids”, she cut hair, sewed, taught piano, listened, advised and lived her life as an example for them to aspire to. She was a generous, dignified, classy, stylish, put-together, smart, and informed woman. She will be remembered with love and admiration. Survivors include Nieces: Janis Bell of Shawnee, KS; Ginger Cook of Cedarege, CO; Marilyn Crews of Raleigh, NC; Judy Helm of Salina, KS; Bobbie Hill of Santa Cruz, CA; Frank Hill of Redstone, CO; Gloria Hill of Kanab, UT; Patty Johnson of Bluffton, SC; Martha Jump of Madras, OR; Carolyn McClellan of Gulfport, MS; Lonelva Morrison of Salina, KS; Nephew: Lyle Sulsar of Hunter, KS. Special Friend: Sharon Young of El Dorado Springs, MO and numerous great and great-great nieces and nephews. Funeral services for Arda Lancaster will be Friday, October 31, 2014, at 2:00 p.m. at St. Elizabeth Catholic Church in El Dorado Springs, MO. The family will receive friends from 1:00 p.m. until service time. Burial will follow in the El Dorado Springs City Cemetery under the direction of Bland-Hackleman Funeral Home. Pallbearers are Bryce Bell, Jared Dutcher, Ken Hacker, Wilber Helm, Will Helm, and John Young. Honorary pallbearers are: Scott Johnson, Jerry Shilt, and Lyle Sulsar.